Major Roshun Steele, commander of the Auburn University Army ROTC office, grew up in a family of educators. Having already achieved great success herself, thanks largely to the discipline that was part of her upbringing, she is continuing her studies through the College of Education’s doctoral program in Adult Education. Since Steele’s mother was a teacher, any parent-teacher conferences involved her father, who worked in aviation manufacturing. Steele said it was just understood that she and her siblings would do well in school and not cause any problems. In spite of her own success, Steele is ever mindful that teachers are overworked and underappreciated. She continues to appreciate the role great teachers play in her life. 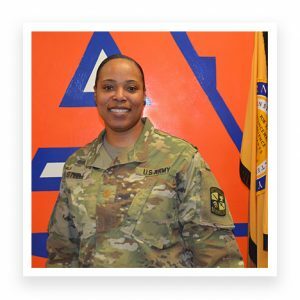 Steele came to Auburn as a Professor of Military Science, and her teaching duties are in addition to her role as ROTC Commander. She is the first African-American woman to command Auburn’s ROTC units that date back to at least the 1870s. Previously, she was in Ottawa as a Canadian Forces exchange officer. Steele has her cadets do a Senior Project that forces them to communicate with others across the campus and community outside of their traditional comfort zones. She feels it is these soft skills that help her cadets thrive inside an organization like the U.S. Army, and that people skills simply cannot be taught from a book.